After seeing some of Idaho, we went from beautiful Coeur d’Alene and traveled west on Highway 2 all across the state of Washington. 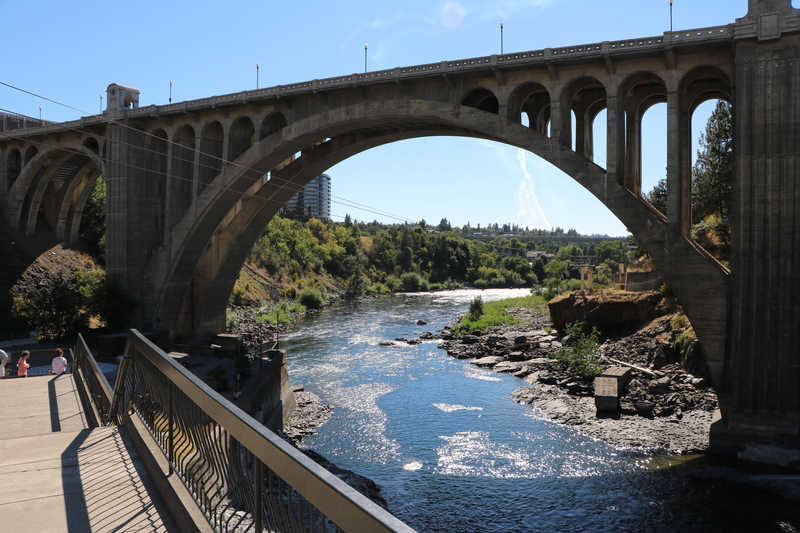 Our initial introduction to the region was Spokane. 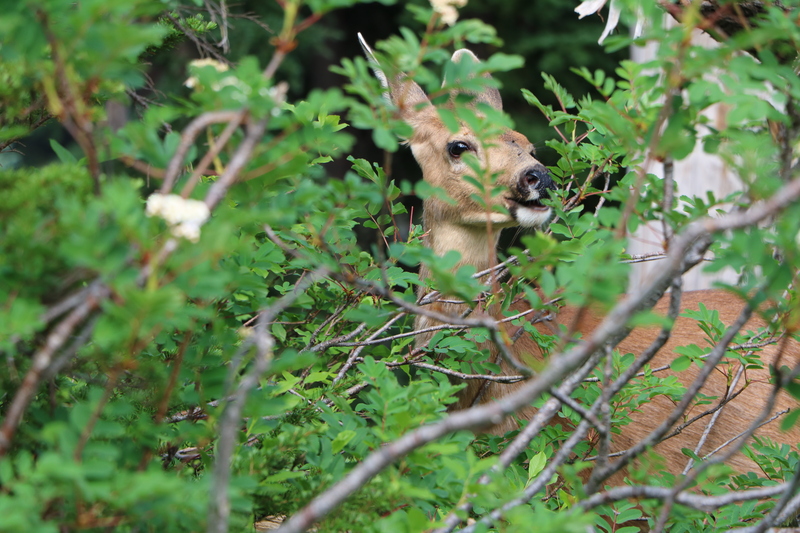 It has spots that are definitely worth seeing, but the first thing we did was grab dinner. I would be remiss if I didn’t mention where we went because it was that good. Yes, the Flying Goat lived up to its TripAdvisor five star rating. The pizza was fabulous, but it is foodie fare – not the traditional pepperoni and tomato sauce pie. The next day, we hit the tourist sites. 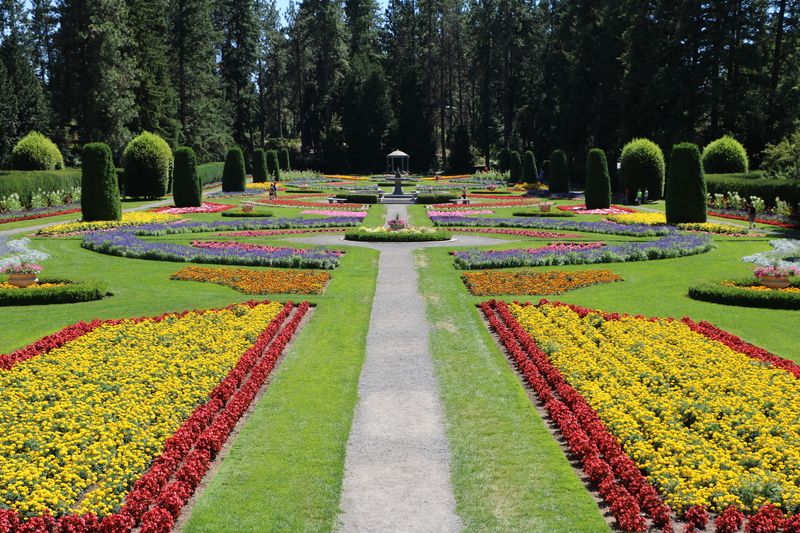 I felt the best thing Spokane has going for it is Manito Park and its five major garden areas. 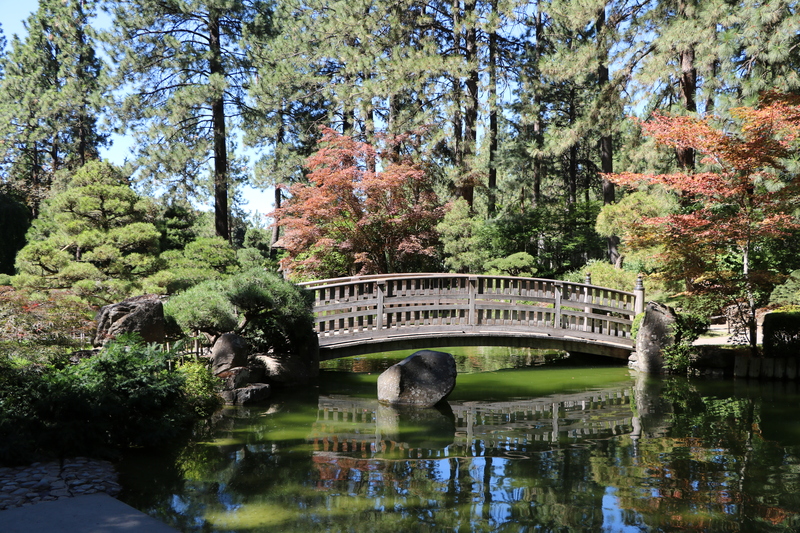 It was designed by the Olmsted brothers who inherited the nation’s first landscape architecture business from their father Frederick Law Olmsted . 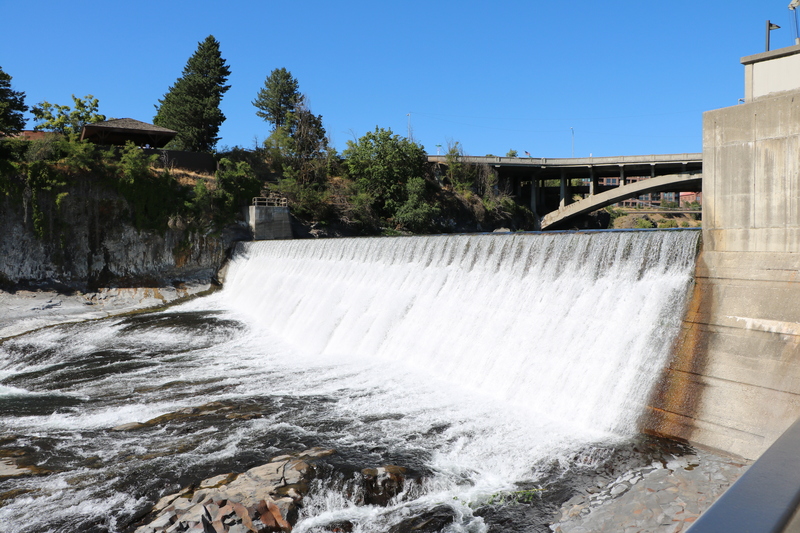 After spending half a day wandering through the park, we drove downtown to see Spokane Falls, a waterfall and dam on the Spokane River. 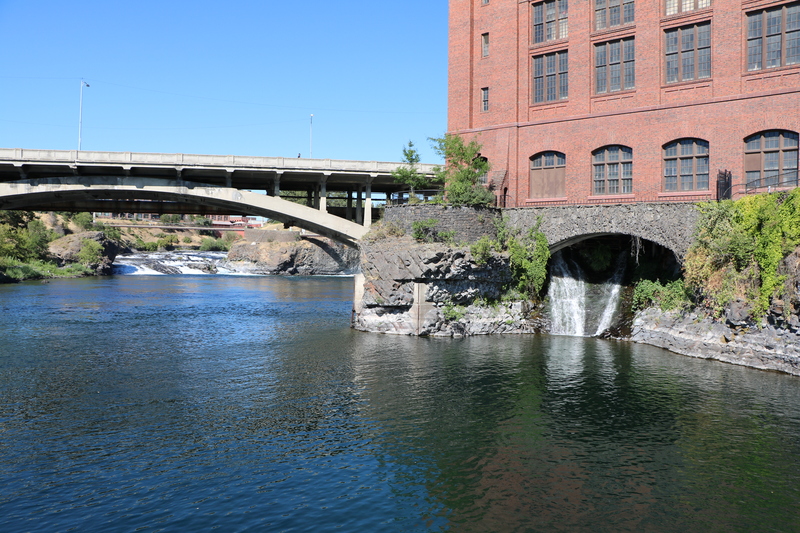 The electrical plant there is the longest-running hydroelectric generation facility in Washington State. The next day we traveled further west to the town of Electric City to see the Grand Coulee Dam. We spent the night at the Coulee Playland Resort. There weren’t any amenities except a view of Banks Lake. 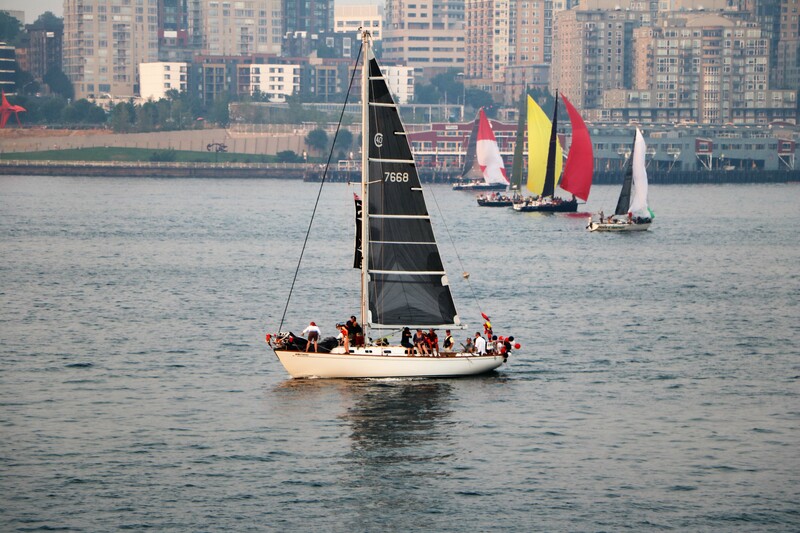 It’s a busy place and boats were constantly being launched out and coming back in. 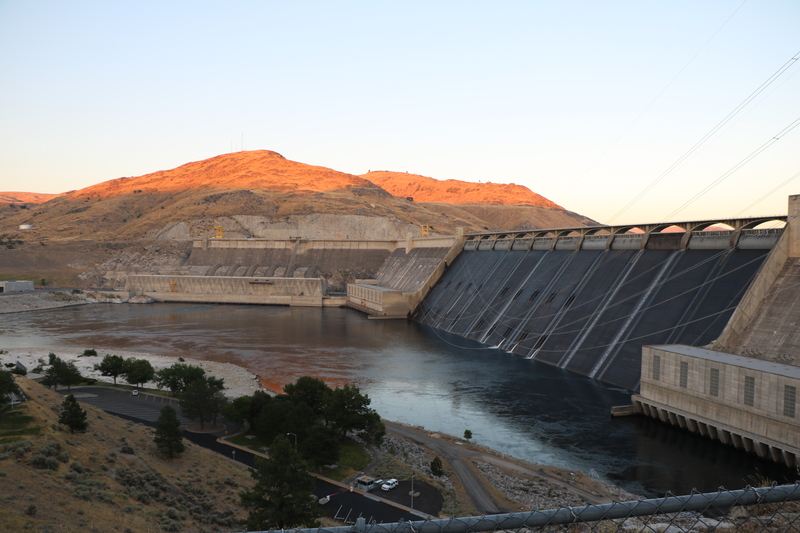 The Grand Coulee Dam was just a short drive away and we headed out to see it in early evening. 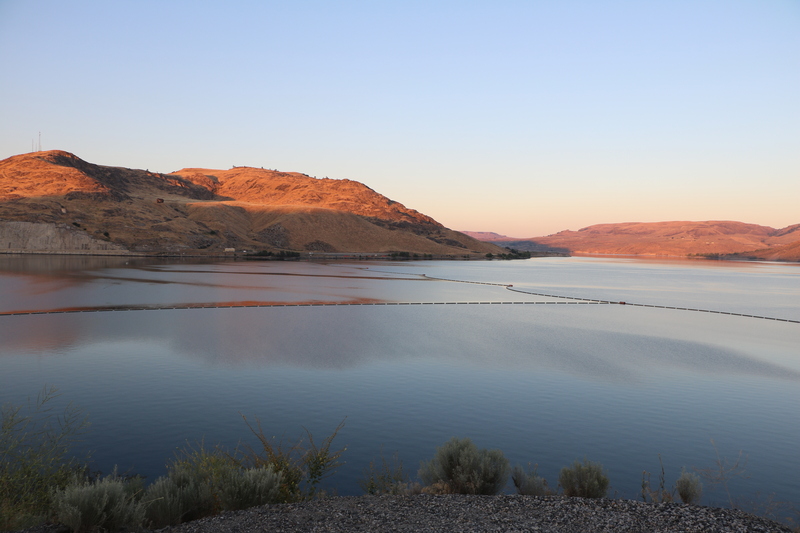 Lake Roosevelt was formed when they dammed up the mighty Columbia River. Grand Coulee Dam is massive. After it turns dark, they have an amazing laser light show right on the sides of the dam. 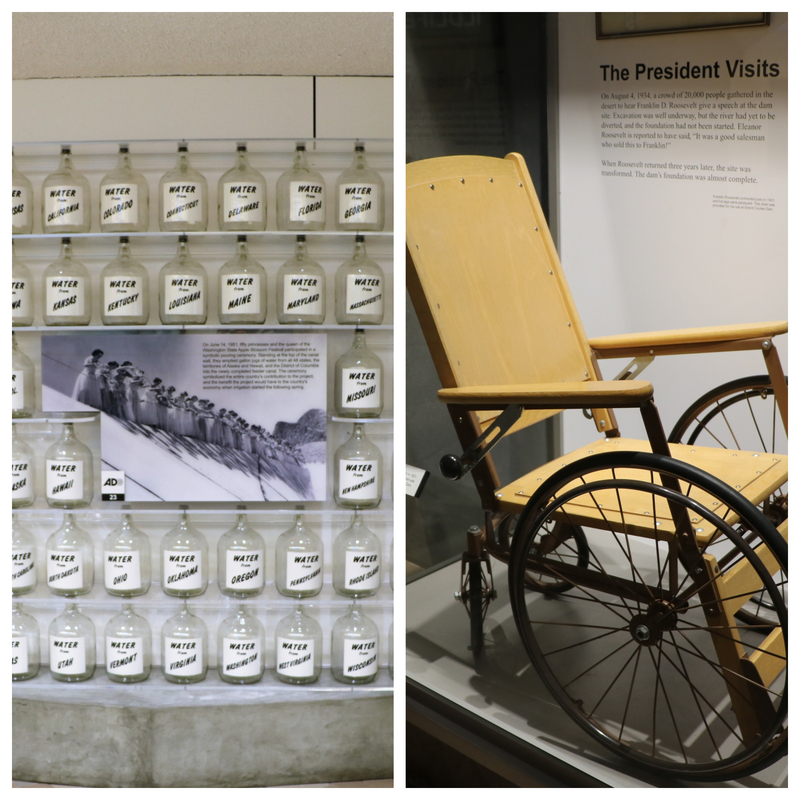 The Visitors Center is open past 10 p.m. so while waiting for dark and the laser show, we looked at all the exhibits and caught up on the history of the dam. The next day we moved on to Lake Chelan . 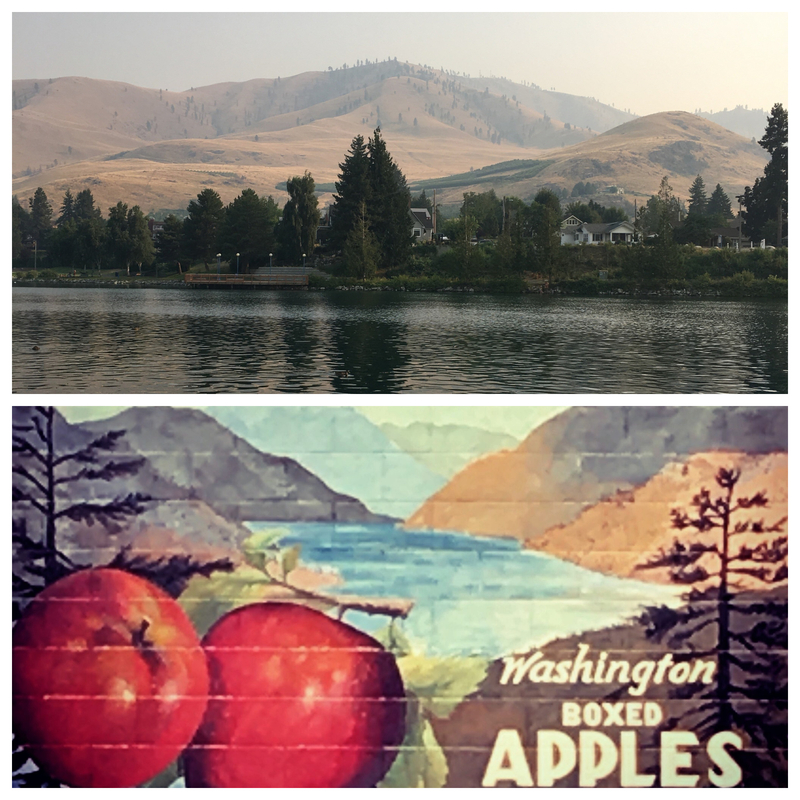 Chelan is a vacation destination on a small lake surrounded by apple orchards. Above is a view of the lake and below that was a mural painted on a building in town. We stayed in the campground at Lake Chelan State Park. It got great reviews on line but we weren’t too impressed. The grassy sites were tight, the electrical power to our RV and others around us kept going out, and it was noisy and chaotic. It was here that we noticed hazy smoke from forest fires. For the rest of the summer the smoke followed us around. 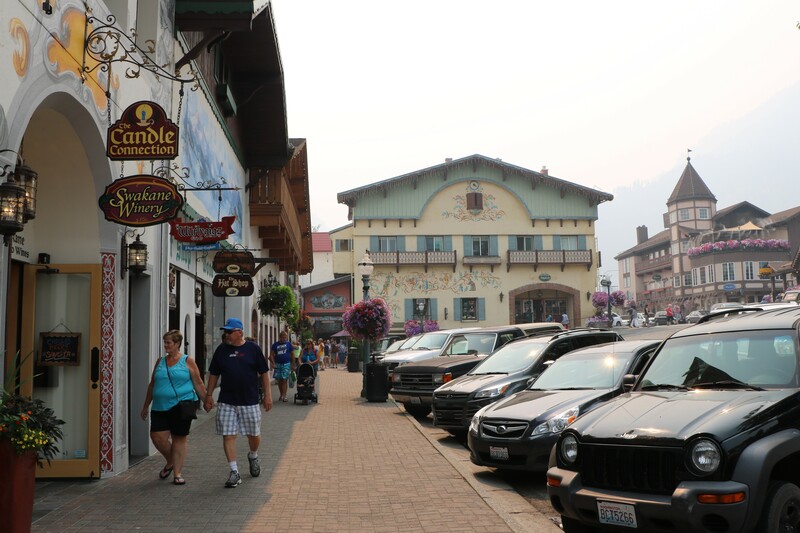 After we left Lake Chelan, we stopped at Leavenworth on our way to Seattle. In the 1960’s local businesses turned the downtown into a Bavarian like village. It draws lots of tourists and is full of restaurants and shops. 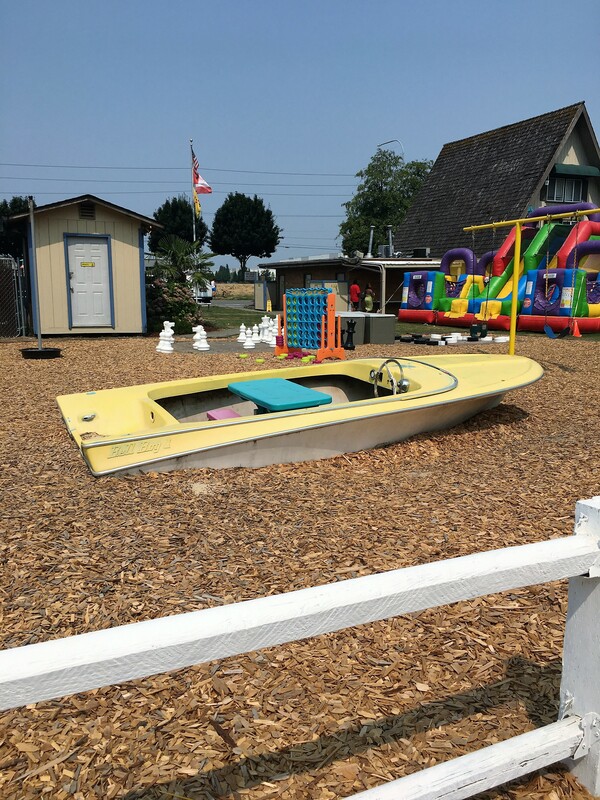 While we say all the sights around Seattle, we stayed in the Seattle/Tacoma KOA in Kent, Washington. 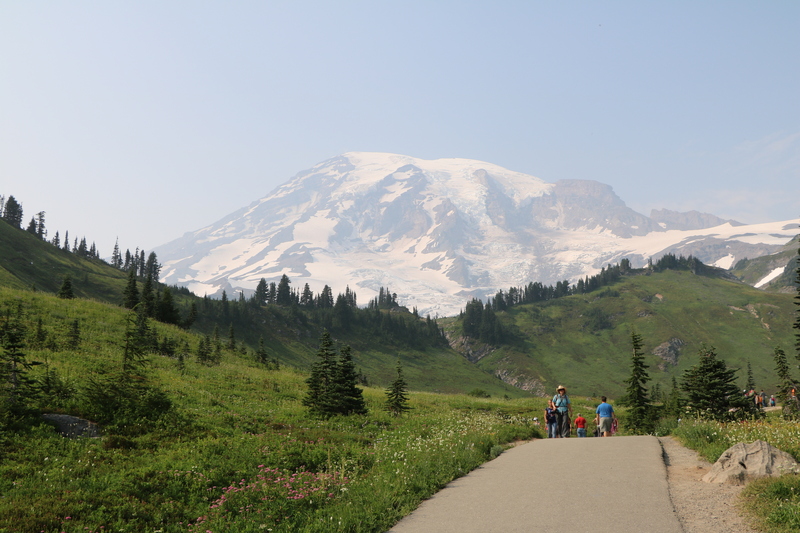 It was a bit of a drive to go into Seatle, but it seemed to be the only game in town; there really aren’t too many other RV parks around and the ones that are, were all booked up. 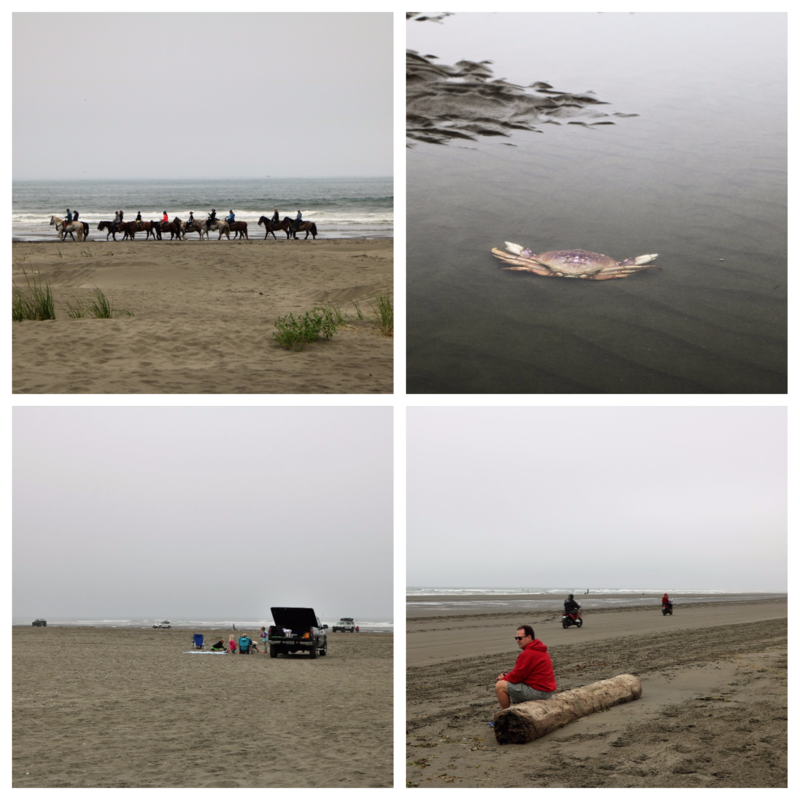 It was overpriced and really not up to KOA standards, but we were just glad to find somewhere we could go. 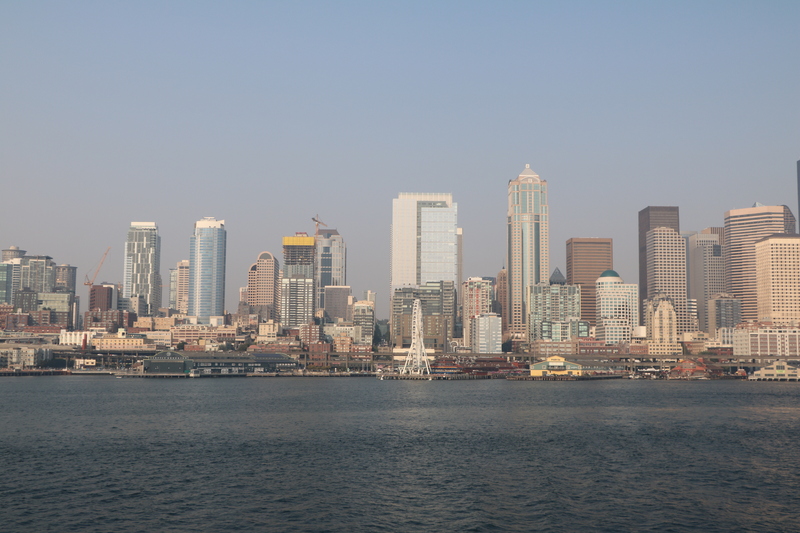 While we were in Seattle, it was misty and smoky due to forest fires in the north. 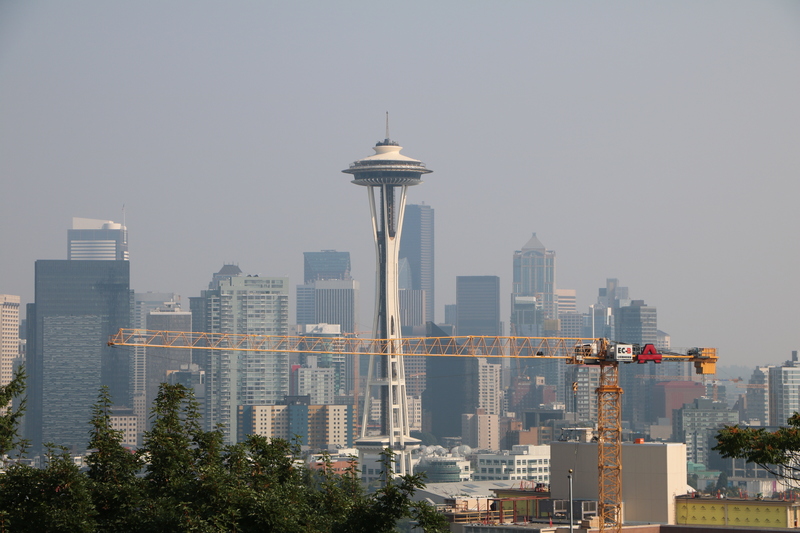 Of Course, I have to include a photo of the Space Needle With all the smoke in the air, we figured that if we went up in it, we wouldn’t be able to see much. So, we just looked at it from a distance. 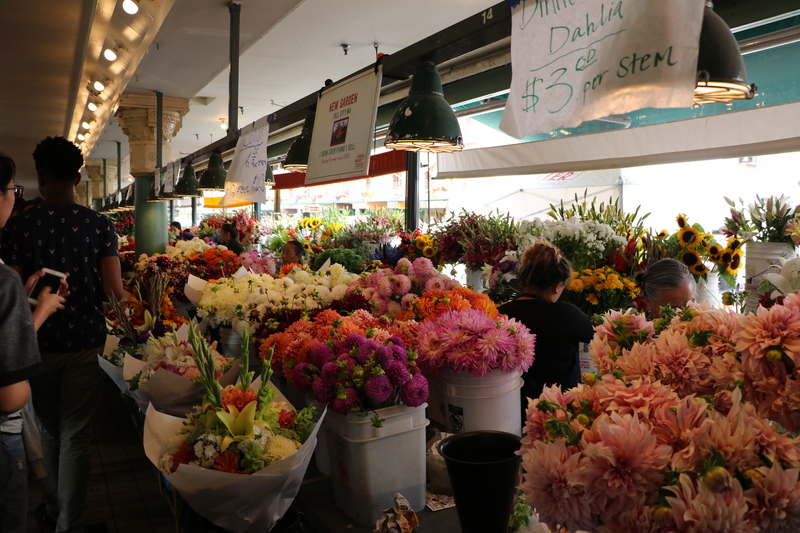 We loved Pike Place Market. It’s like a farmers’ market, craft fair, and specialty shop extravaganza. 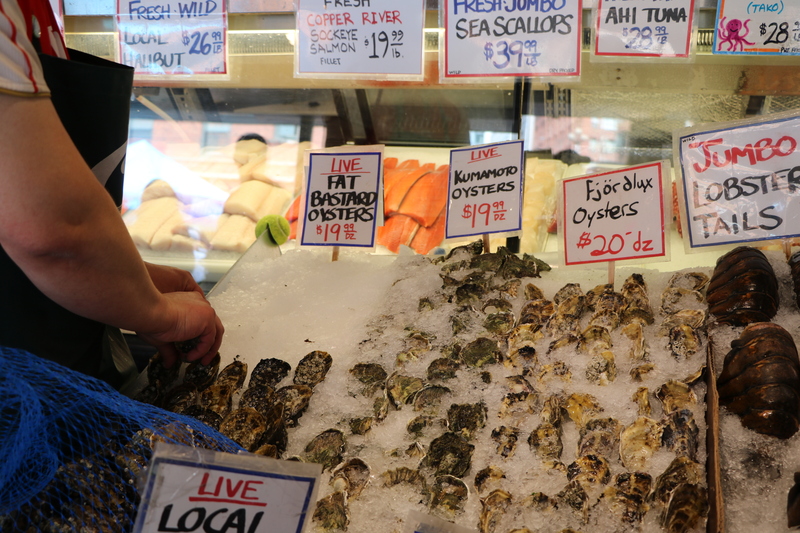 One of the busiest stalls was the Pike Place Fish Market where purchased fish is thrown back and forth between the employees before it is wrapped up. There was stall after stall of beautiful bouquets and a huge one could be bought for only $15. 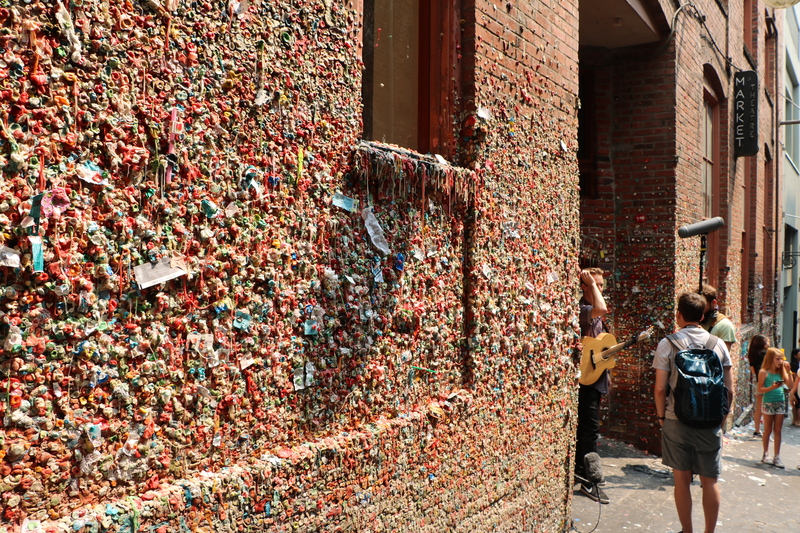 I found it gross, but a big tourist draw is the Market Theater Gum Wall. 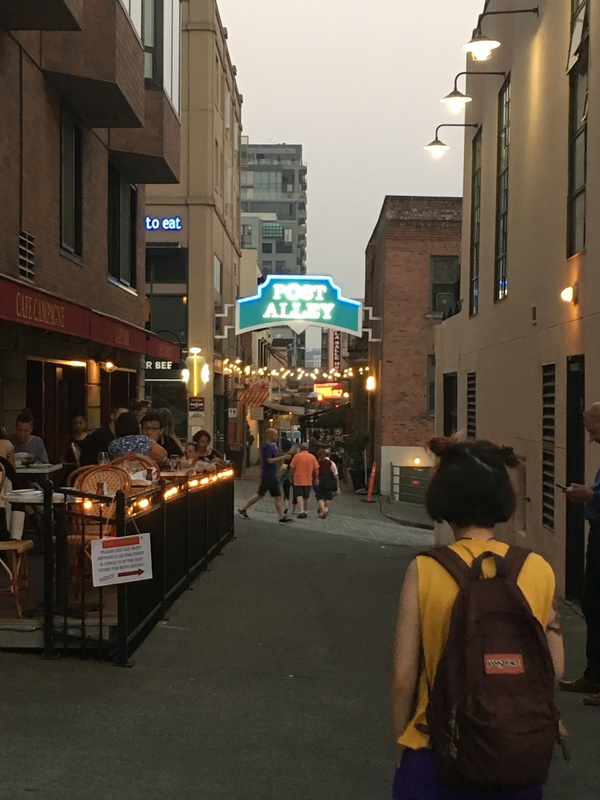 It’s in a passageway called Post Alley which is just left of the big neon Public Market sign. It started in the 1990’s when patrons in line for the improv theater parked their gum on the brick building wall. At night Post Alley looks like a different place – restaurants open up including one called The Pink Door, which we found enchanting. It’s not marked with a sign or anything – just a pink door. 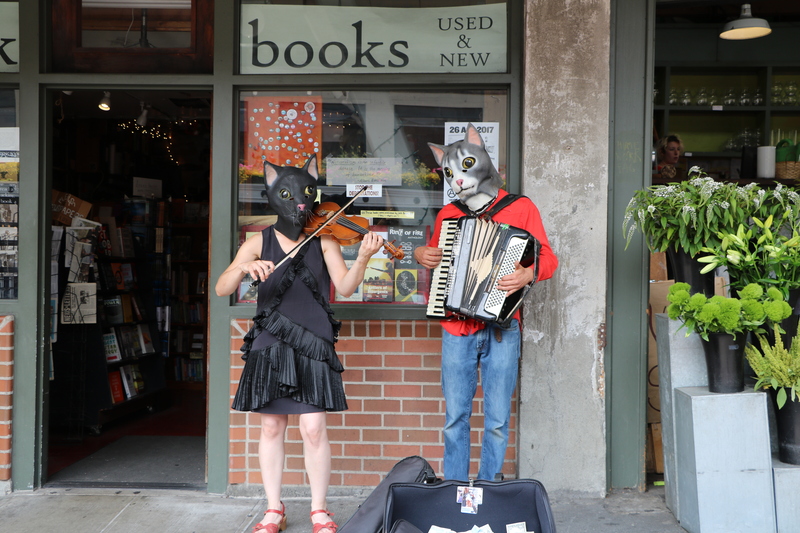 The inside is charming, the Italian – American food was divine and it’s known for its unique entertainment. 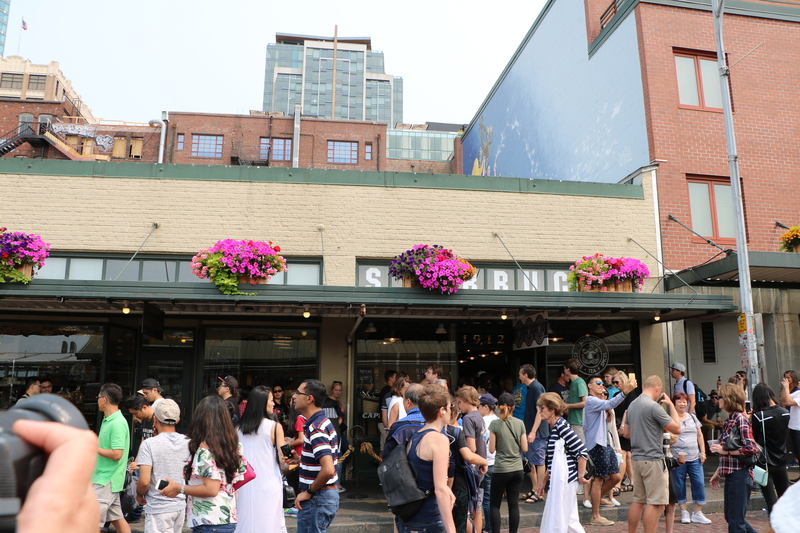 People were crammed inside and out of the Pike Place Starbucks store which was their first location, opened in 1971. Lots of colorful street performers were all over. 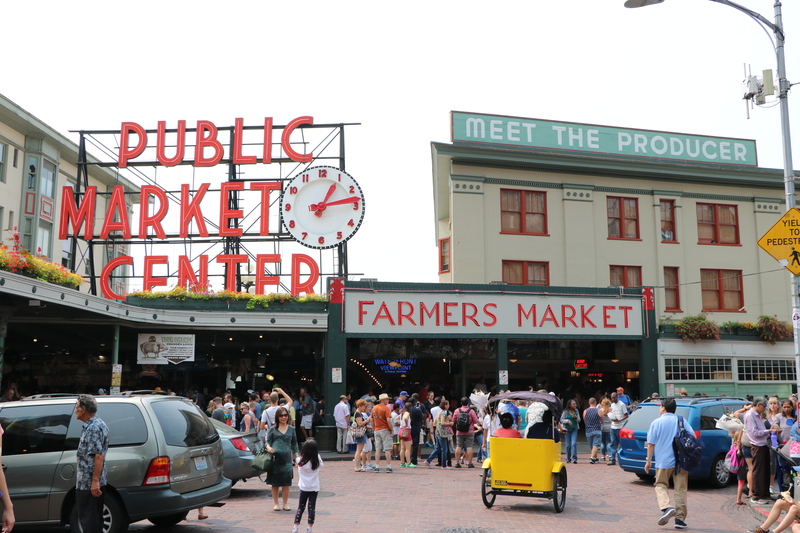 We took a Free Walking Tour called Seattle 101. The idea is, you “tip” the person giving the tour what you think it is worth. We thought our tour was great and our guide showed us around the downtown area and shared local history. 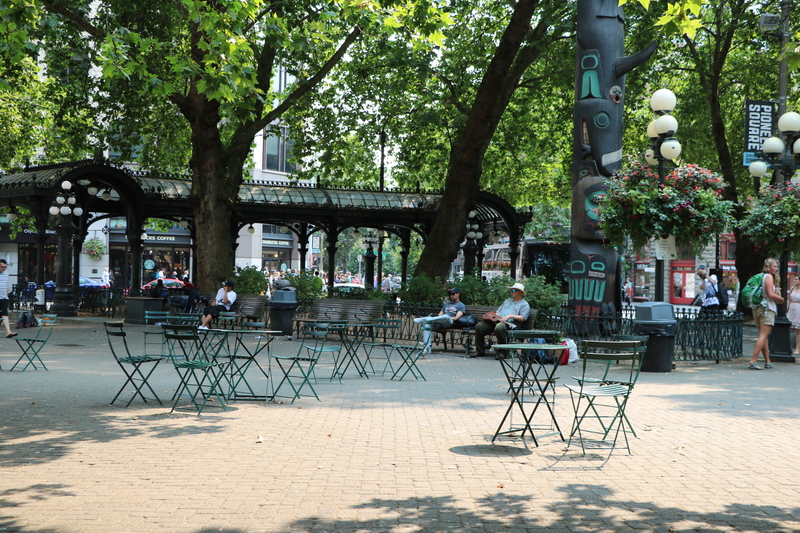 Above is Pioneer Square, where the first residents settled. 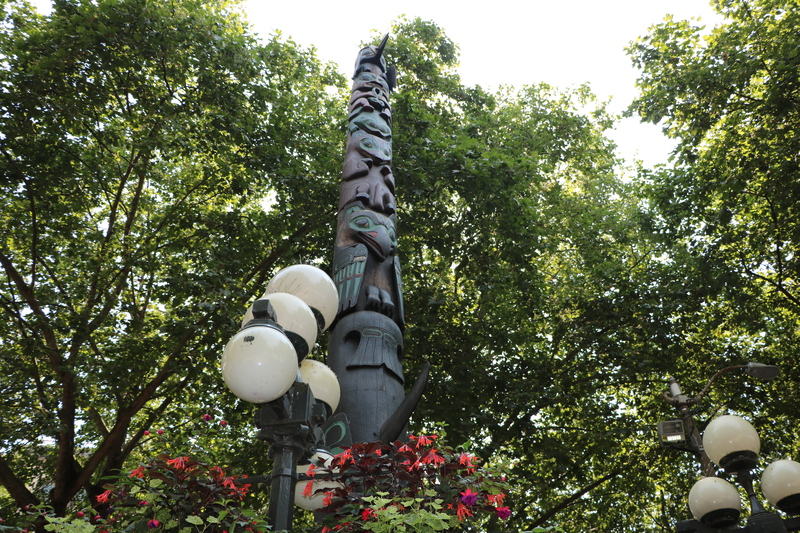 The totem pole in Pioneer Square has a colorful history. It is believed that it was stolen from Native Americans in Alaska and brought to Seattle by 15 businessmen in 1897. 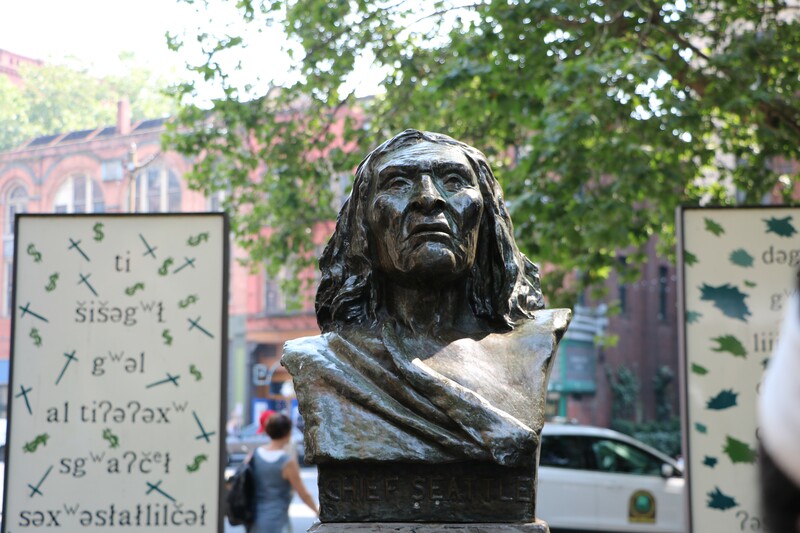 Also in Pioneer Square is a bust of Chief Seattle who was the leader of the Suquamish tribe. History says he got along with the first settlers very well. 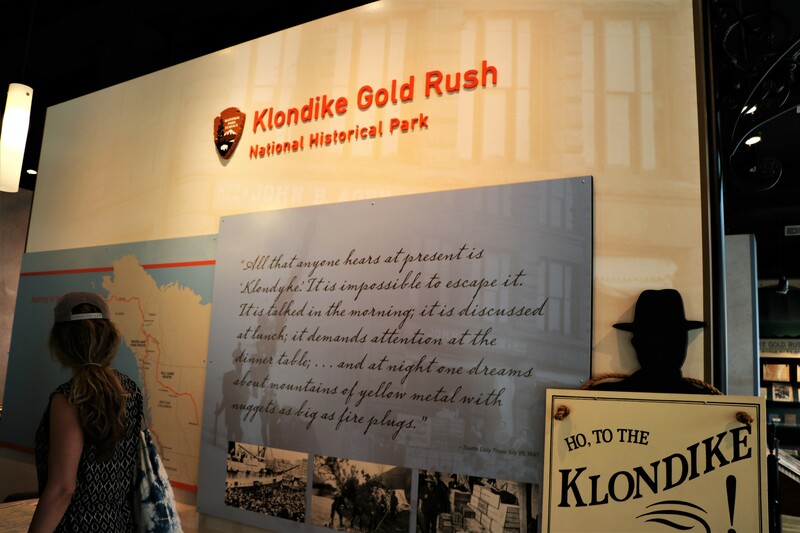 Very close to Pioneer Square is the Klondike Gold Rush National Historic Park. Seattle was the place prospectors gathered up equipment and supplies before heading up to mine gold in the Klondike up in northwest Canada. This “park” which is actually a museum building has some great exhibits to view and we felt it was worthwhile to see it. 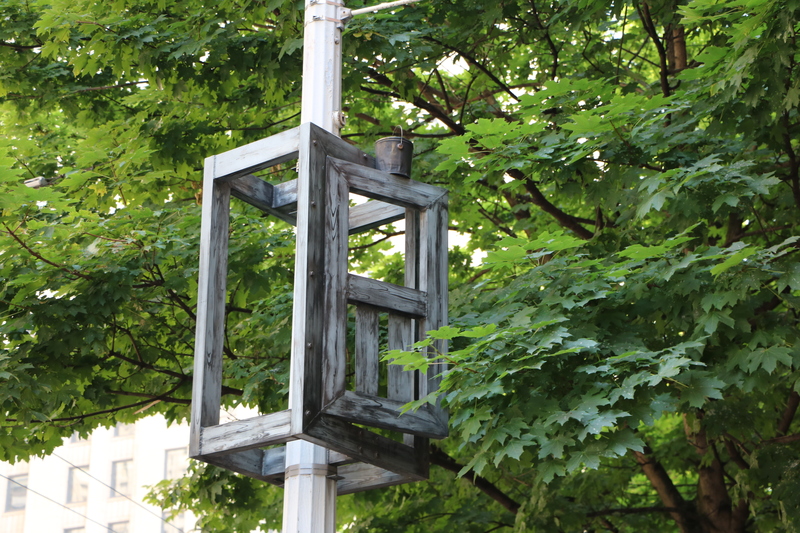 This street art commemorates the Great Seattle Fire of 1889 that destroyed 25 blocks in the business district. It was started by some glue that ignited in a cabinet shop. As a result of the fire, the rebuilding was constructed 22 feet higher and there is an underground level of the old 1800 facades. 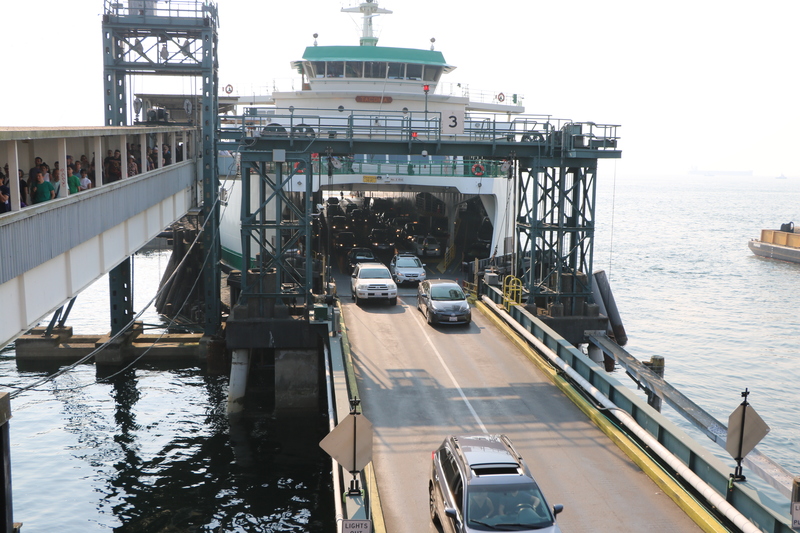 One evening we took the ferry over to nearby Bainbridge Island. It’s a small town with restaurants and shops. 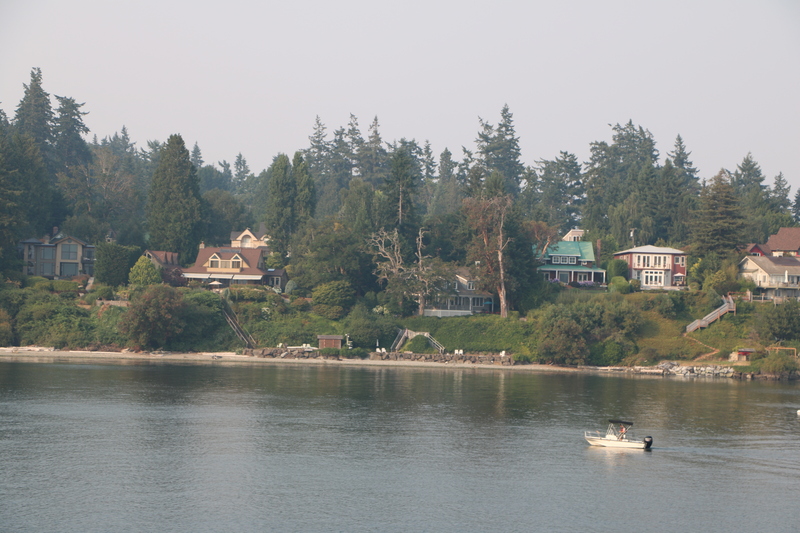 It was hazy due to the smoke from fires in Vancouver, but still pretty. I think it would have been even more charming on a clear day. 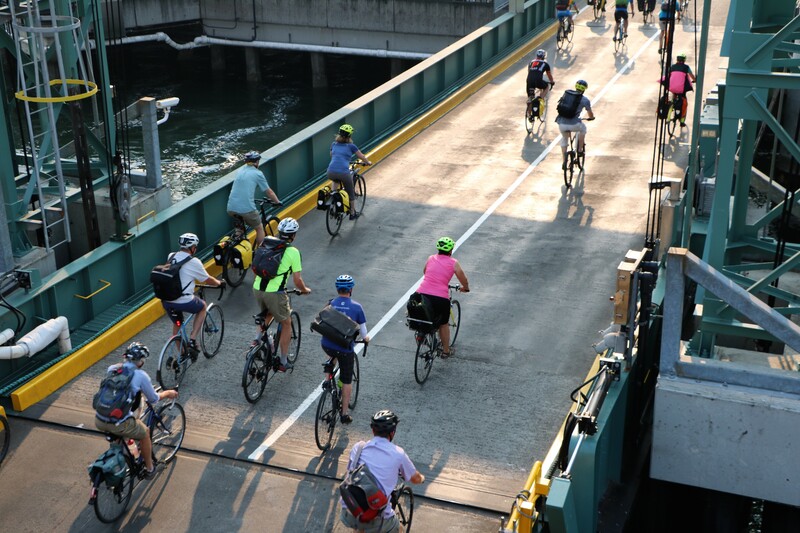 The ferry holds cars on the bottom and it looked like lots of commuters on bikes as well. 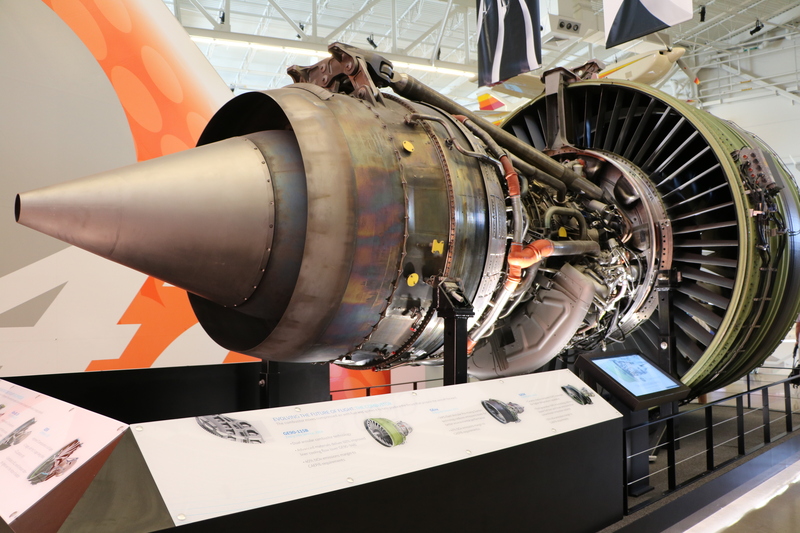 We toured to Boeing Plant just outside of Seattle in Everett, Washington. 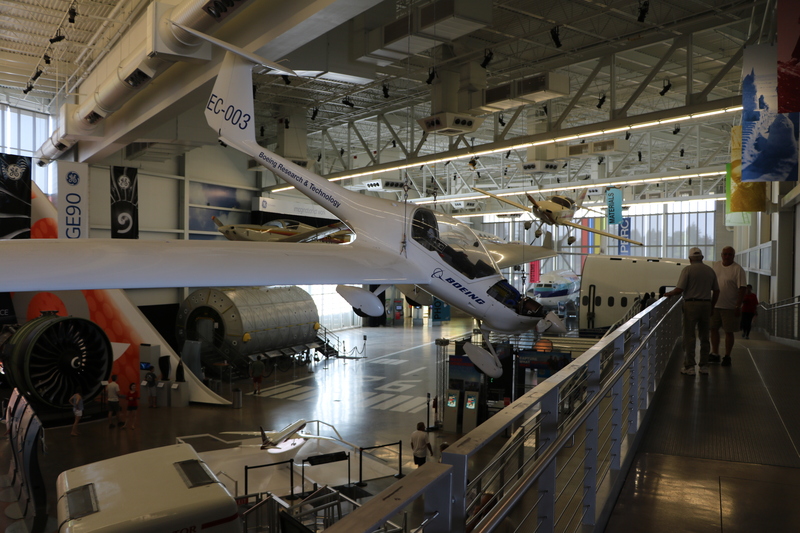 We were awed by the size and scale of these giant flying machines. 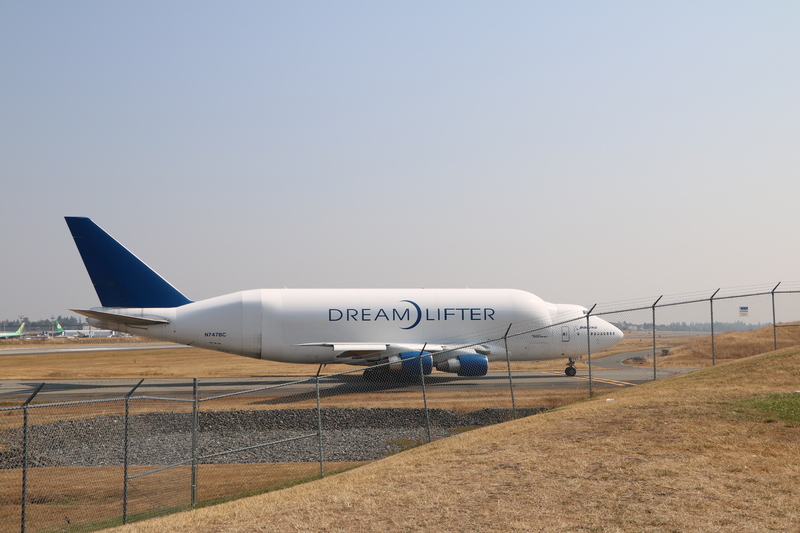 While we were on site, the Dreamlifter landed. 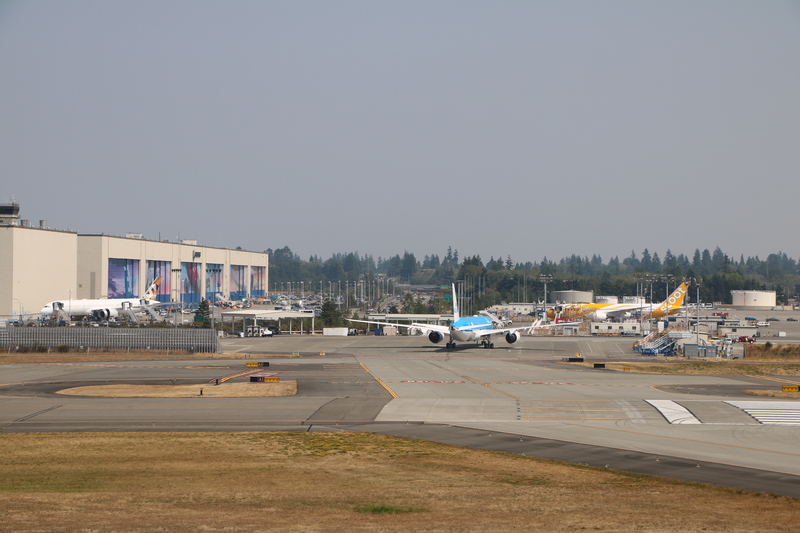 It has the largest cargo hold of any aircraft in used to haul freight. We chose to dry camp and the sides were big and spacious. There was a short trail to the beach. It was overcast and even though it was August, it was jacket weather. Just for fun, we drove the jeep along the shore. We stayed at the Shady Firs RV Park & Campground. We found it by reading campground reviews. It’s run by some interesting characters but nice people who don’t have a website for the park and only accept cash. The sides are roomy and nice, but getting through the gate to get into the park will make you swear if your rig is as big as our 44 footer. I’m afraid we did get some scratches which we fortunately were able to buff out later. Mt. 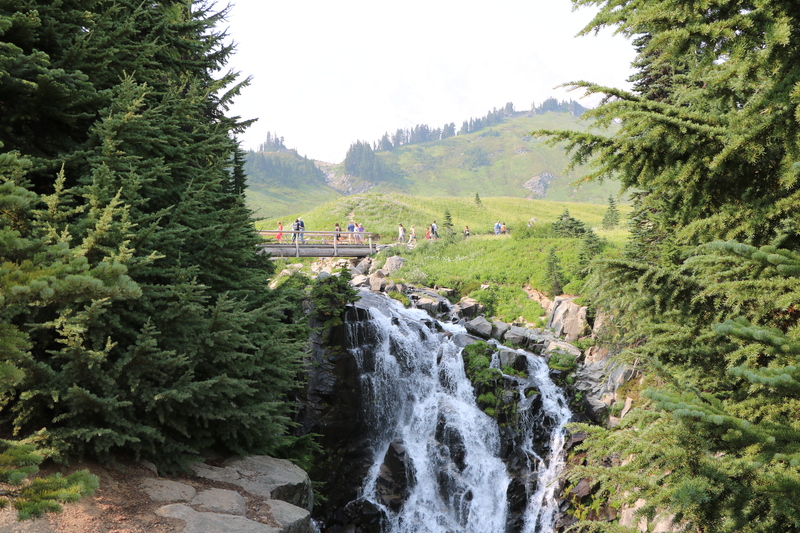 Rainier National Park has a plethora of hiking trails around the different park areas. 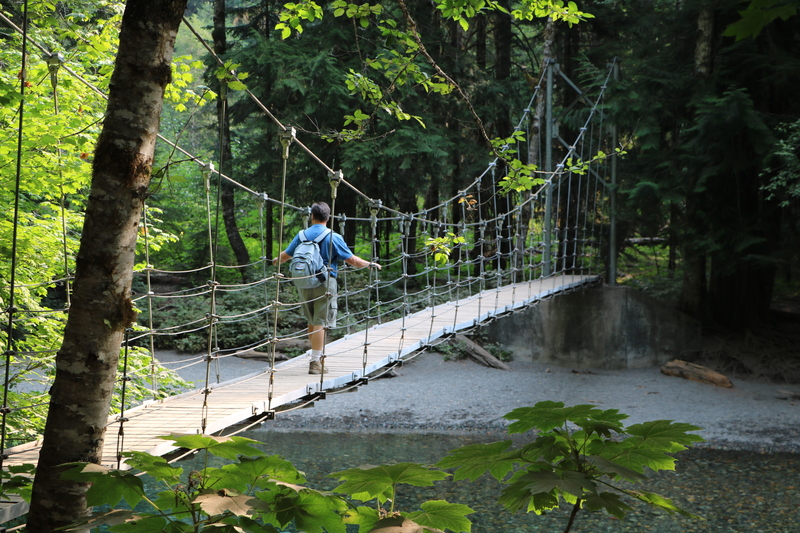 People must register if they wish to go on an overnight/camping hike, but it’s not necessary for the short day hikes. We entered the park at the Stevens Canyon Station and found ourselves right by the trail head for the Grove of the Patriarchs Trail. 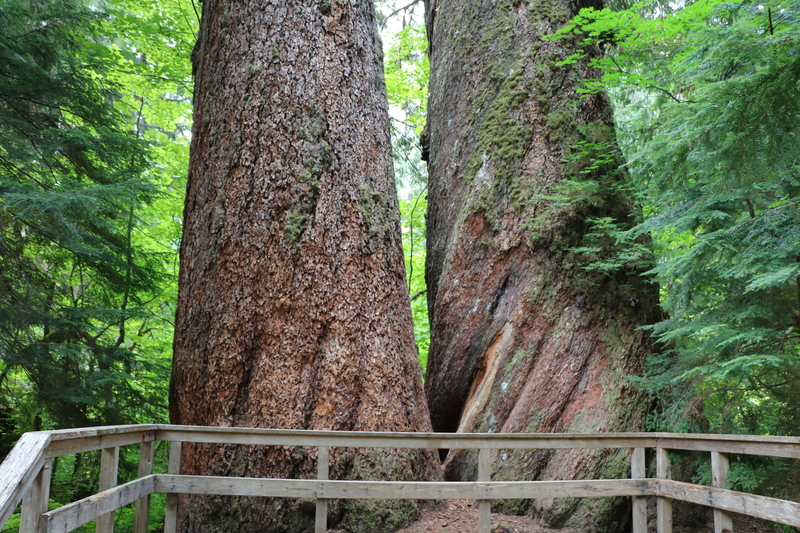 The environment is perfect for these old trees to last for many years and grow to a huge size. It was just a gorgeous hike. 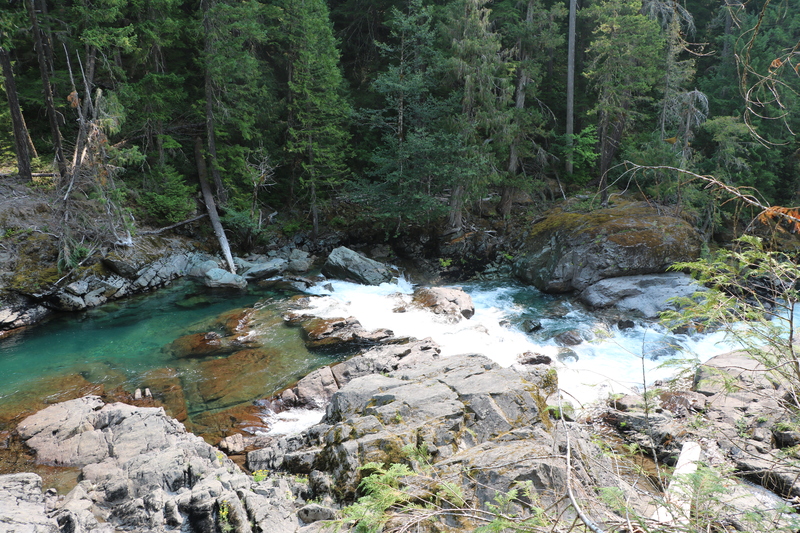 The water really is the color seen in these photos! 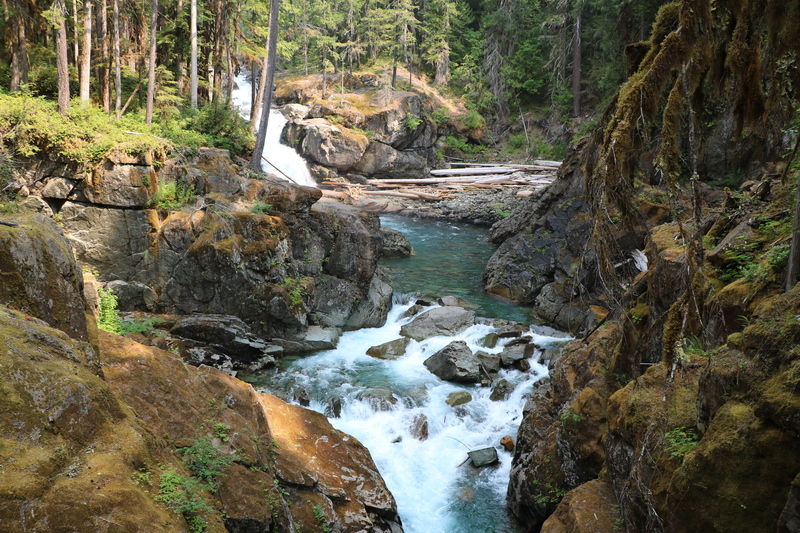 The Paradise Area of the park is where one of the two lodges are. The Paradise Inn was built in 1916. 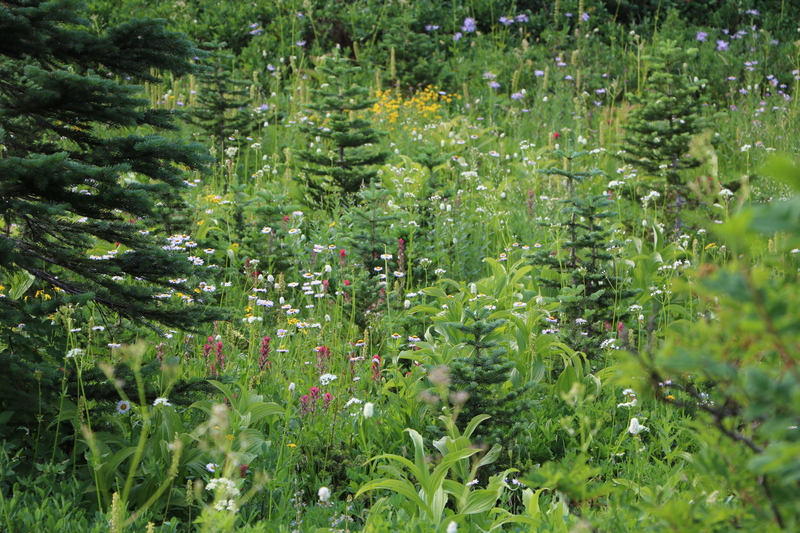 Nearby the Paradise Inn was a paved walking trail full of wild flowers. The wild flowers were everywhere and much more amazing than this photo shows. 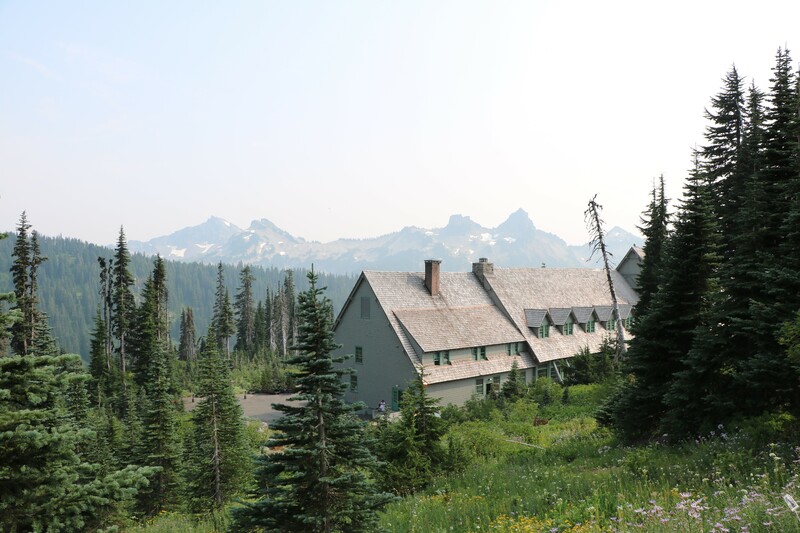 The Paradise Jackson Visitor Center is also in this area and has exhibits explaining the geological science of the mountain. 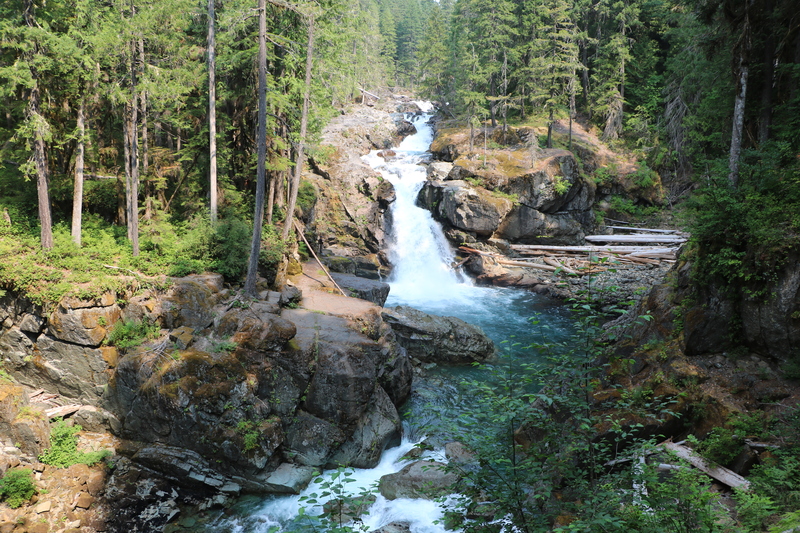 This pretty little waterfall is right off the paved walkway by the lodge. From there we went on to see Mt. St. Helens. We stayed in Mt. 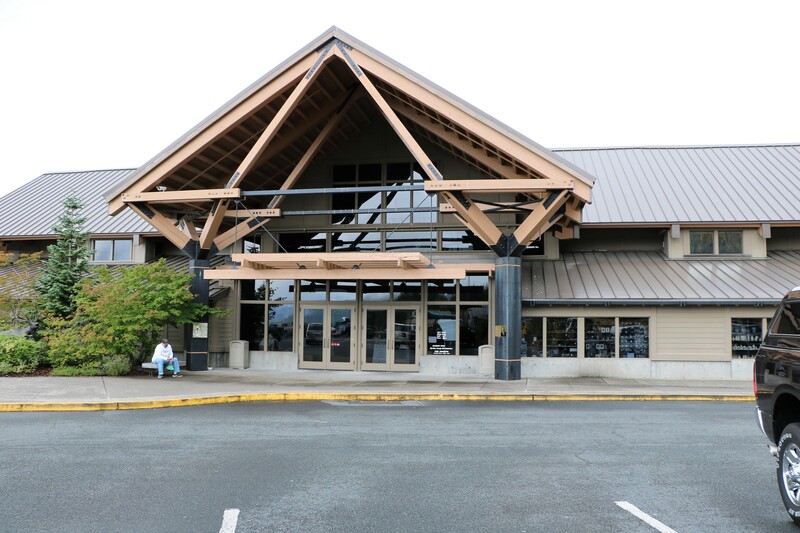 St. Helens RV Resort. 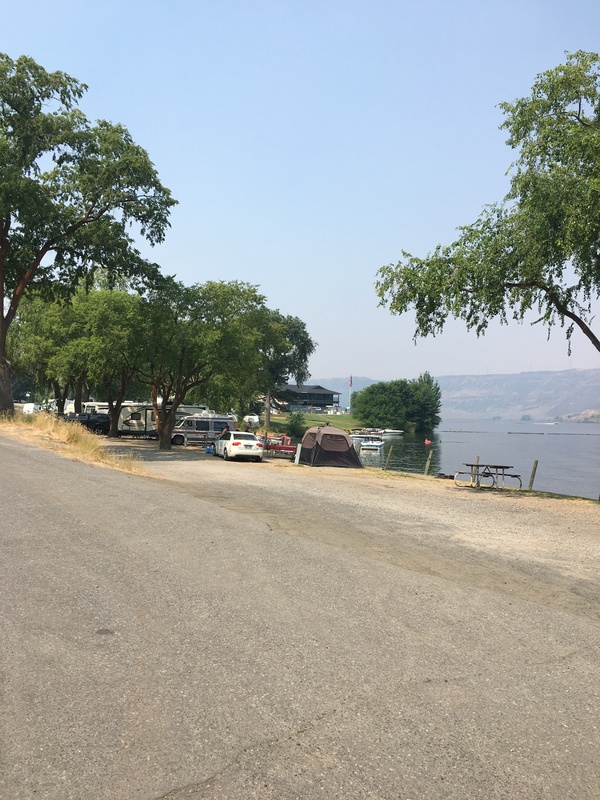 It’s not a resort at all but a small campground up on hill that was full hookup and in a great location since it is on Spirit Lake Highway, the same road that the three visitor type centers in Mt. 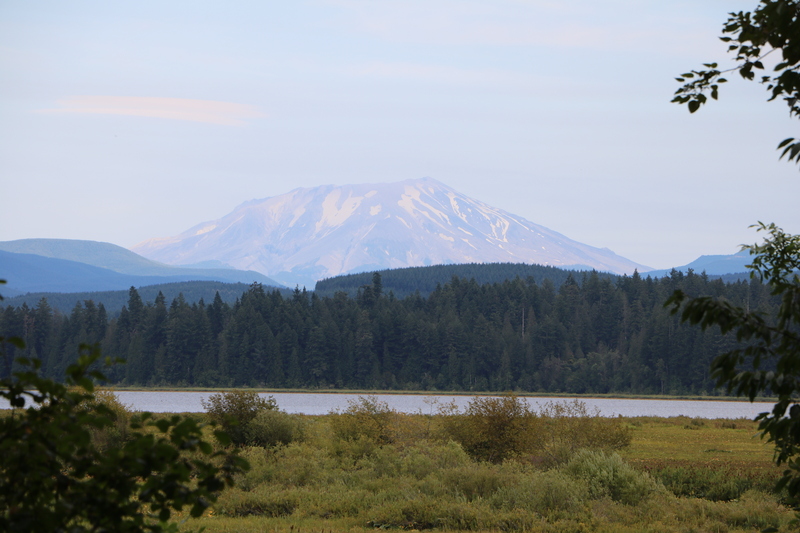 St. Helens National Volcanic Monument is on. 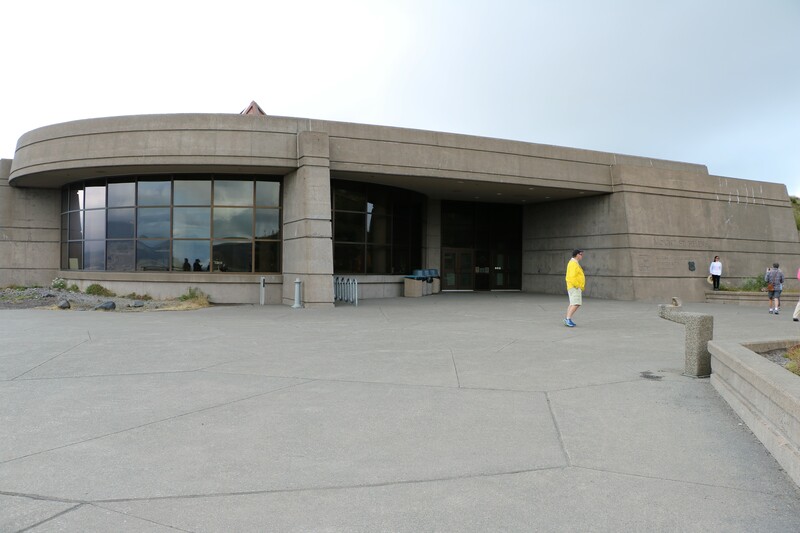 Mount St. Helens Visitor Center was a good place to start exploring the area. It’s actually run by the state park system and it told the background and story of how Mt. 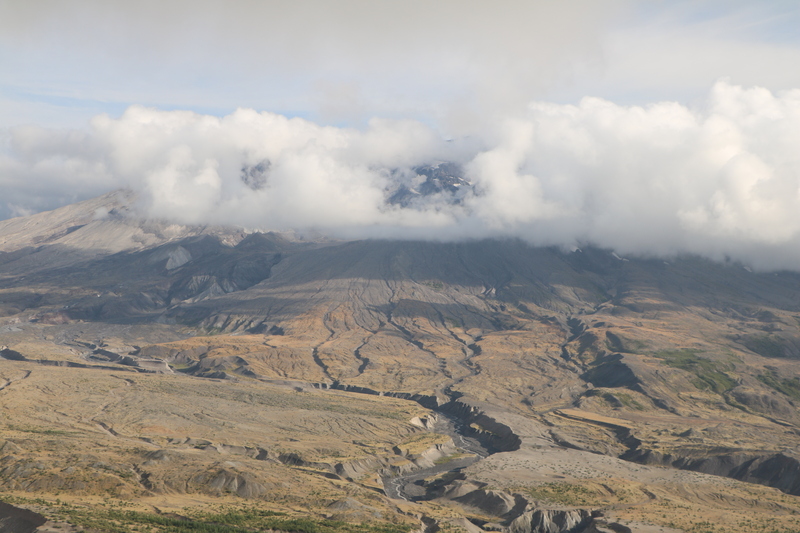 St. Helens erupted in May 1980. In back of the center there is a half mile trail that has a portion of board walk so the wet lands of Silver Lake can be viewed. 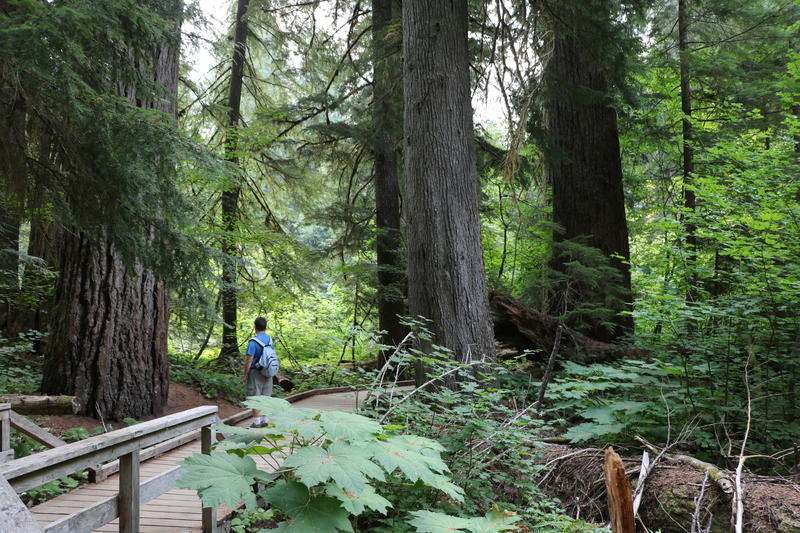 The Forest Learning Center is worth seeing but a lot of it tells how the Weyerhaeuser Company now uses best practices for foresting. At what seemed like the very end of Spirit Highway was Johnson Ridge Observatory. 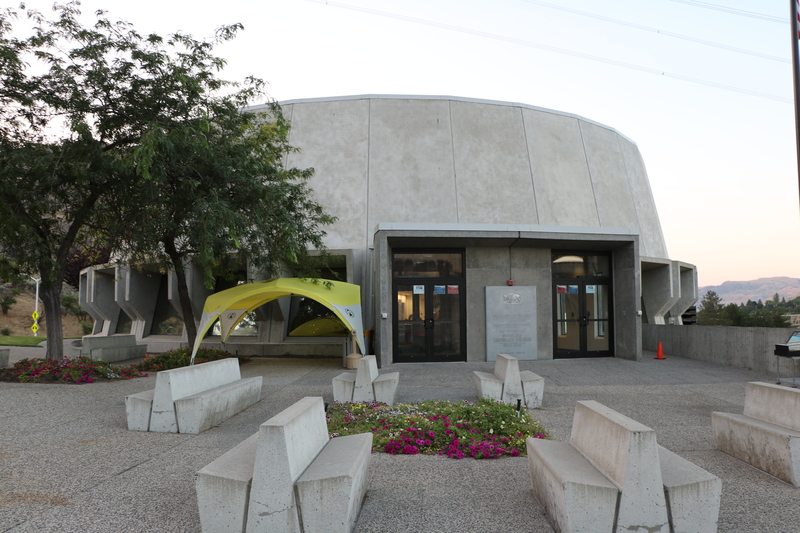 Besides movies and exhibits there is a walkway winding around the outside of the building where you can catch views of the devastation the volcanic eruption caused. 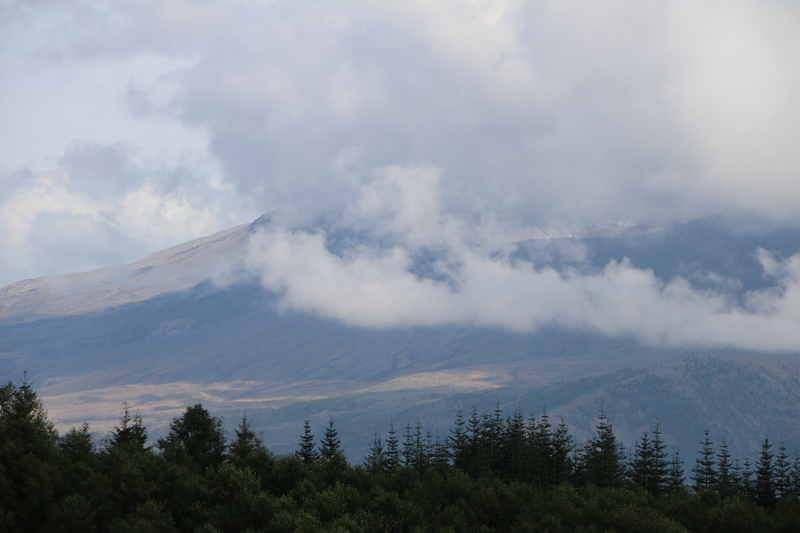 It was cloudy and smoky so I wasn’t really able to get a good shot of the top of what’s left of the mountain. The National Forest Service elected to leave the land they own alone and let it come back on its own. It still looks basically like a wasteland. The lands that are owned by Weyerhauser were replanted and look green and healthy. At the time of the explosion, there were youth camps, resorts, and cottages along the shores of Spirit Lake. 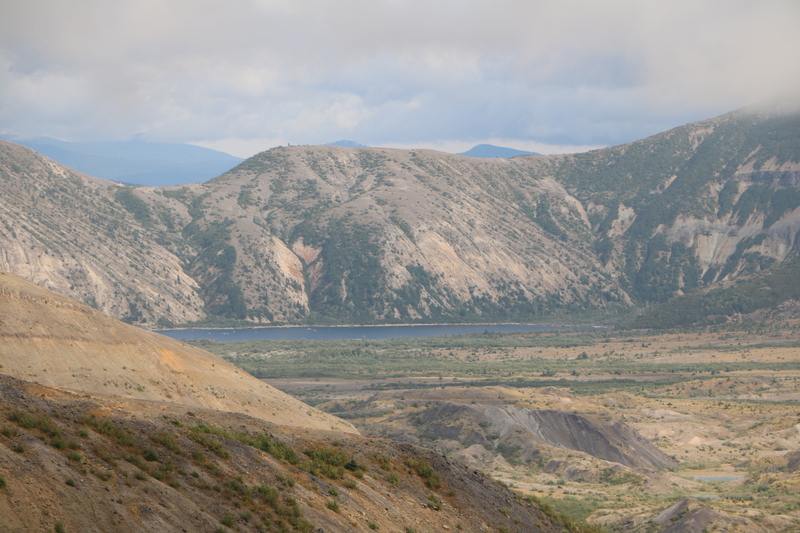 The lava mud slide totally annihilated every building and bit of landscape and uprooted trees clogged the entire displaced lake. But eventually the area filled up with water again and there is a “new” Spirit Lake today, although it is shallower and wider than the original. 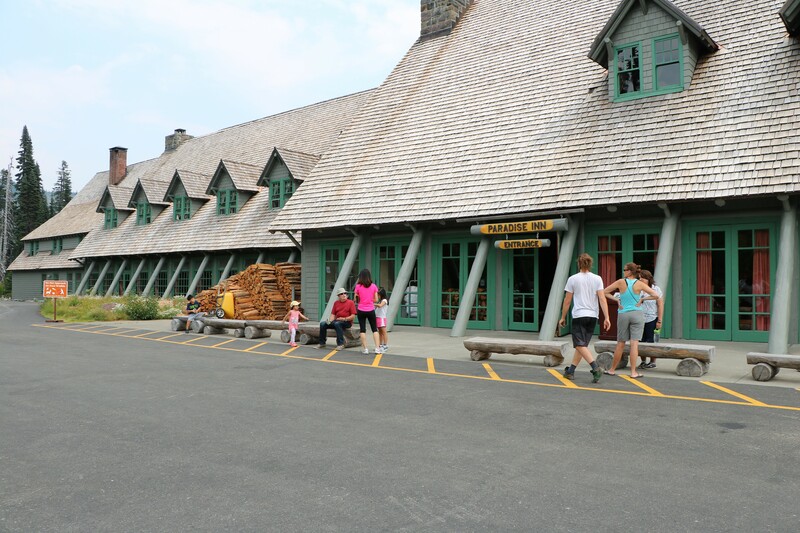 It was time to move on to Oregon and on our next stop, we unexpectedly found ourselves at Louis and Clark’s last one (before turning around for their return trip)!